Cat & Kitten | MWAH! S&P Shakers Figurines | One Price Low Flat Shipping! From Westland Giftware's Mwah! 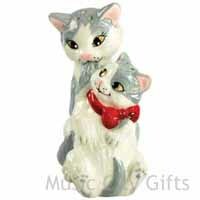 Salt and Pepper Shakers Collection, Cat And Kitten. Made of ceramic with glossy finish. Measures 3.75" tall. Hand wash only. This 2 piece salt and pepper shakers set features a grey and white mother cat carrying her smiling kitten by the scruff of the neck. Their inner ears and noses are painted in a soft pink color and both have golden colored eyes and the mother's has long eyelashes and the kitten has a red ribbon around its neck. A strong small magnet holds them together. Need a little salt? How about some pepper? Mwah! magnetic salt and pepper shakers will have you shaking in no time! Kissable, cute, and irresistible, there's a place for Mwah! in every home.